Mastro-Valerio was educated at the Salvador Rosa Institute in Naples, Italy (1906-1912), and came to the U.S. in 1913. He settled in Chicago, and after a brief period as a commerical artist, established a portrait studio near the Loop. Among his patrons were the industrialists Harvey S. Firestone and Anheuser Busch. He moved to Ypsilanti in 1919 and received a mural commission to following year from the Ypsilanti National Bank. Mastro-Valerio taught at Ypsilanti Normal College (now Eastern Michigan University) during the summers of 1922 and 1923. He was also on the part-time faculty at the University of Michigan (1924-26) where, after a trip to Italy in 1927, he was appointed to the full-time faculty. In addition to portraits and murals, his oeuvre includes landscapes, seascapes, and figure studies in oil and watercolor. 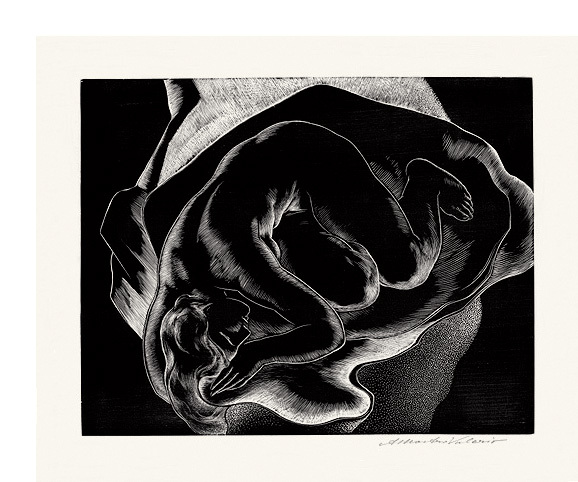 He is best known for his mezzotint prints, particularly his female nudes. 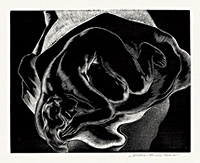 His outstanding work helped to revive mezzotint as an artistic medium in the United States. A member of the Ann Arbor Art Associate, the Chicago Society of Etchers, the Society of Design (Associate 1951), he retired from teaching at the University of Michigan in 1952. Morning Paper- - 1941, Mezzotint. Edition 350. Signed in pencil. Image size 8 15/16 x 5 9/16 inches (227 x 141 mm); sheet size 12 7/16 x 9 3/16 inches (316 x 233 mm). A superb, velvety impression, with full margins (1 9/16 to 1 13/16 inches) on cream wove paper. Original brown paper tape hinge remains on the top sheet edge, otherwise in excellent condition. Presentation print of the Chicago Society of Etchers, with the blindstamp in the bottom left margin. In the Space- - 1944, Wood Engraving. C 226, LC 5. Edition 200. Signed in pencil. Image size 6 1/16 x 7 1/2 inches (154 x 191mm); sheet size 9 1/4 x 12 1/4 inches (235 x 311 mm). A fine, black impression, with full margins (1 9/16 to 2 3/8 inches), on white wove paper, in excellent condition. Complete in the orignal Woodcut Society letterpress presentation folder. 1944 Presentation Print, Twenty-sixth Publication of the Woodcut Society. Printed by Torch Press, Cedar Rapids. Collections: College of Wooster Art Museum, Library of Congress, Newark Public Library.